emb = trainWordEmbedding(filename) trains a word embedding using the training data stored in the text file filename. The file is a collection of documents stored in UTF-8 with one document per line and words separated by whitespace. emb = trainWordEmbedding(documents) trains a word embedding using documents by creating a temporary file with writeTextDocument, and then trains an embedding using the temporary file. emb = trainWordEmbedding(___,Name,Value) specifies additional options using one or more name-value pair arguments. For example, 'Dimension',50 specifies the word embedding dimension to be 50. 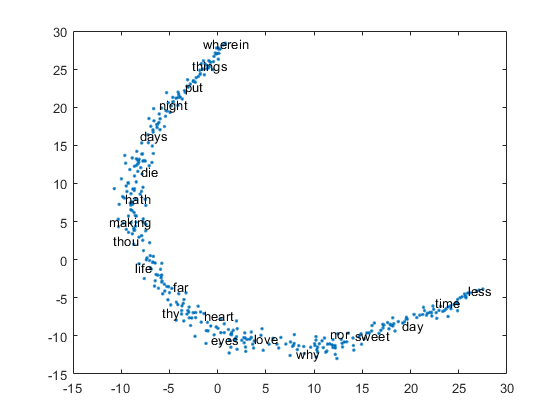 Train a word embedding of dimension 20 using the example text file exampleSonnetsDocuments.txt. This file contains preprocessed versions of Shakespeare's sonnets, with one sonnet per line and words separated by a space. Training: 100% Loss: 2.62407  Remaining time: 0 hours 0 minutes. 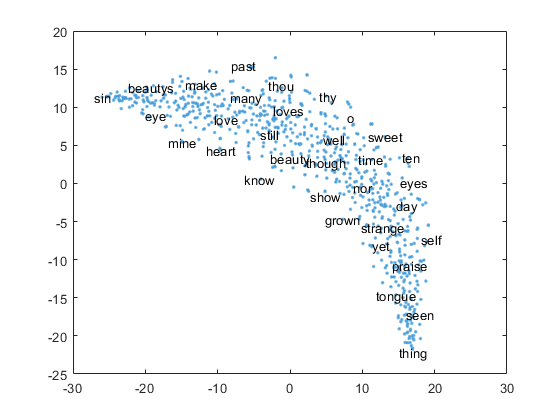 View the word embedding in a text scatter plot using tsne. Train a word embedding using the example data sonnetsPreprocessed.txt. This file contains preprocessed versions of Shakespeare's sonnets. The file contains one sonnet per line, with words separated by a space. Extract the text from sonnetsPreprocessed.txt, split the text into documents at newline characters, and then tokenize the documents. Training: 100% Loss: 2.70808  Remaining time: 0 hours 0 minutes. 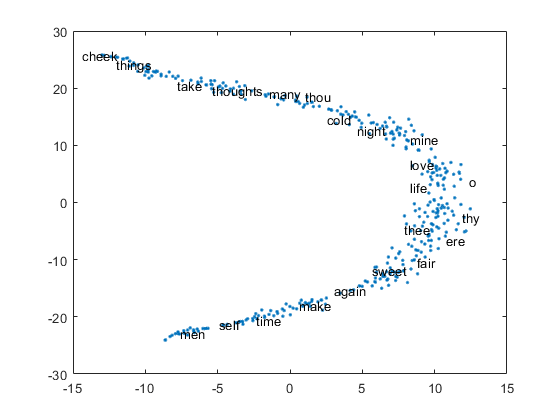 Visualize the word embedding in a text scatter plot using tsne. Specify the word embedding dimension to be 50. To reduce the number of words discarded by the model, set 'MinCount' to 3. To train for longer, set the number of epochs to 10. Training: 100% Loss: 2.68829  Remaining time: 0 hours 0 minutes. Example: 'Dimension',50 specifies the word embedding dimension to be 50. Dimension of the word embedding, specified as the comma-separated pair consisting of 'Dimension' and a nonnegative integer. Size of the context window, specified as the comma-separated pair consisting of 'Window' and a nonnegative integer. Model, specified as the comma-separated pair consisting of 'Model' and 'skipgram' (skip gram) or 'cbow' (continuous bag-of-words). Factor to determine the word discard rate, specified as the comma-separated pair consisting of 'DiscardFactor' and a positive scalar. The function discards a word from the input window with probability 1-sqrt(t/f) - t/f where f is the unigram probability of the word, and t is DiscardFactor. Usually, DiscardFactor is in the range of 1e-3 through 1e-5. Loss function, specified as the comma-separated pair consisting of 'LossFunction' and 'ns' (negative sampling), 'hs' (hierarchical softmax), or 'softmax' (softmax). Number of negative samples for the negative sampling loss function, specified as the comma-separated pair consisting of 'NumNegativeSamples' and a positive integer. This option is only valid when LossFunction is 'ns'. Number of epochs for training, specified as the comma-separated pair consisting of 'NumEpochs' and a positive integer. Minimum count of words to include in the embedding, specified as the comma-separated pair consisting of 'MinCount' and a positive integer. The function discards words that appear fewer than MinCount times in the training data from the vocabulary. Inclusive range for subword n-grams, specified as the comma-separated pair consisting of 'NGramRange' and a vector of two nonnegative integers [min max]. If you do not want to use n-grams, then set 'NGramRange' to [0 0]. Initial learn rate, specified as the comma-separated pair consisting of 'InitialLearnRate' and a positive scalar. Rate for updating the learn rate, specified as the comma-separated pair consisting of 'UpdateRate' and a positive integer. The learn rate decreases to zero linearly in steps every N words where N is the UpdateRate. Output word embedding, returned as a wordEmbedding object. File input to the trainWordEmbedding function requires words separated by whitespace. For files containing non-English text, you might need to input a tokenizedDocument array to trainWordEmbedding. To create a tokenizedDocument array from pretokenized text, use the tokenizedDocument function and set the 'TokenizeMethod' option to 'none'. 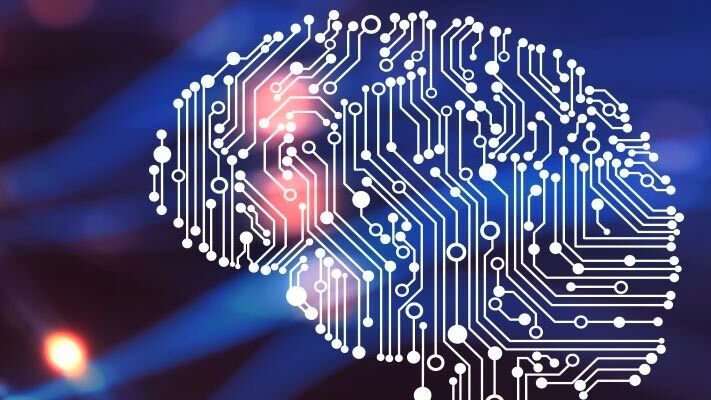 The training algorithm uses the number of threads given by the function maxNumCompThreads. To learn how to change the number of threads used by MATLAB®, see maxNumCompThreads.